Bloggers4UKIP: Why should we pay it EU? You owe us. Why should we pay it EU? You owe us. It seems the team behind EUmafia.EU are trying to sway the elections and trying to bully the UK. They have upped the fantasy bill to a whopping 100 billion Euro. They seem to forget that for years Britain has been the second largest contributor to the EU budget, our tax payers pounds have paid for lots of EU assets, including the majority input to the building of the EU parliament buildings, roads in the eastern bloc and many other silly things such as the hefty wage packet and pensions for the unelected twonks that are now trying to come up with ways to cause fear and division in the UK. Here's the thing, we are not going to be swayed, nor will the people of the UK be browbeaten into submission by a bunch of fools that are angry because they have to put more money into the pot to keep the chaotic project EU going. Yes you, France and Germany. Merkel and Hollande should shut the hell up. 1. Because they are gone this year, either voted out or not wanted. 2. We don't care what you think. 3. There is no legal precedent under international law that they could force us into paying. 4. They have more to lose if we just say Bye Bye. 5. Their whining is just getting boring now. Heres a piece from the biased Beeb. The UK will not pay a €100bn (£84.6bn) "divorce bill" to leave the EU, Brexit Secretary David Davis has insisted. He told ITV's Good Morning Britain the UK would pay what was legally due, "not just what the EU wants". It comes amid claims by the Financial Times that the financial settlement sought by the EU has risen from €60bn. Mr Davis said the UK treated its EU "rights and obligations" seriously but it had "not seen any number", adding the EU was playing "rough and tough". 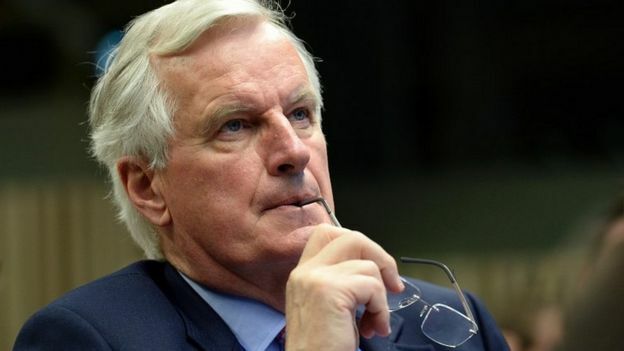 The EU's chief negotiator Michel Barnier is due to publish his guidelines for the talks later although they are not likely to include any financial demands. Mr Davis said the negotiations had not started in earnest but indicated the UK would set down a marker when it came to talks over the divorce settlement. "We are not supplicants," he said. "This is a negotiation. They lay down what they want and we lay down what we want." Various figures had been knocking around, he said, but asked directly whether a figure of €100bn was acceptable, he replied: "We will not be paying €100bn." Brexit Secretary David Davis tells Today EU nationals can expect "generous settlement"
He added: "We will do it properly. We will take our responsibilities seriously. What we've got to do is discuss in detail what the rights and obligations are. "We have said we will meet our international obligations, but there will be our international obligations including assets and liabilities and there will be the ones that are correct in law, not just the ones the Commission want." He subsequently told the BBC that the €100bn figure should be viewed "with a pinch of salt" and the negotiations would not "end up there", adding that it was up to the two sides to agree and he did not want the European Court of Justice to become involved. Many Conservative MPs argue the UK does not owe the EU anything given the size of the contributions it has made over the past 40 years. A recent report by a House of Lords committee argued the UK was not legally obliged to pay a penny although to do this would threaten any chance of a post-Brexit trade deal. If the UK was to walk away without a deal, Mr Davis conceded that it would not owe anything but he insisted "nobody was seeking that outcome". "We want a deal. We think we can get a deal that is beneficial to everybody" he told Radio 4's Today. The EU has insisted that the UK will have to accept liabilities stemming from its membership, including contributions to the EU Budget. The EU has already listed some sort of agreement on a payment from the UK as a precondition for opening talks on a trade deal. Previous calculations had placed the financial settlement likely to be demanded by the EU at between 50 and 60bn euros. The Financial Times, using the same economic model with new data from around Europe, suggests that has now gone up to 100bn euros. There are reports in Brussels that the difference might include demands from countries like France and Poland for UK contributions to farm subsidies. 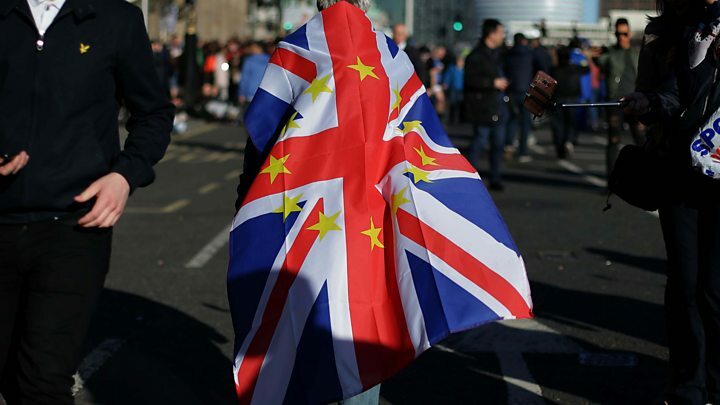 The EU may also be planning to refuse to allow the UK a share of the EU's assets including buildings and bank deposits. The suggestion that the payment would be made in instalments would not do much to soften the blow from the British perspective, the BBC's Europe correspondent Kevin Connolly said. The revelation comes amid growing tensions between the UK and EU following reports of a dinner in Downing Street last week, in which European Commission President Jean-Claude Juncker is said to have told Theresa May that Brexit could not be a success. On Tuesday, Mrs May said Mr Juncker would discover that she could be a "bloody difficult woman". Mr Davis, who was one of ten people present at the dinner, said accounts of the meeting were "gossip and spin" and while there were some differences in key areas, the atmosphere had been "constructive" rather than hostile. While the process was currently in a "rough and tumble" phase of manoeuvring, he believed a "generous settlement" could be reached over the status of EU nationals living in the UK and Britons living on the continent which guaranteed "pretty much exactly" the same rights they enjoy at the moment. This, he said, could be done in the form of an "exchange of letters" between the two sides pending the revision of existing EU Treaties.